Boot Surface 3 from external SSD? Discussion in 'Surface 3 (Atom)' started by wpcoe, Feb 22, 2018. I've replaced my Surface 3 with a Surface Pro 2017 because the S3 was just. too slow. I attributed much of the slowness and lack of responsiveness to the eMMC drive, kind of like using a USB thumb drive for a hard drive. Would it speed up the Surface 3 noticeably to have it boot off of, and run off of, an external SSD plugged into the USB port? Benchmark performance of a USB attached 6Gbps SATA SSD is around 50-60% of it's performance when connected internally to SATA port. YMMV likely downward. I haven't tested this in a real world use case especially running the OS. A high volume of small I/Os (typical of OS drives) would likely result in a performance hit. Even so there's a potential it could be better than the eMMC of an S3. Additionally you'll need to set the USB device as non-removable as by default Windows will not boot from a removable drive. There are a couple utilities for this or using a Windows-to-go certified device (generally more expensive) will work. The other slow pole in the tent with Surface 3 is the underwhelming Atom SoC. It's ok doing one task but degrades quickly in multitasking even background tasks render it sluggish on a random basis. According to these benchmarks USB 3.0 was faster than eMMC on these benchmarks. Following eMMC 5.0 test was done with 16GB model. 8GB model is slower than 16GB. To measure the USB 3.0 performance, we connected an SSD via a USB-SATA bridge JMS567. We used the Samsung SSD 850 PRO 256GB model for this test. USB 3.0 access speed is ~10x faster than USB 2.0 on the XU4! Those eMMC results are not unlike Surface 3 eMMC benchmarks for sequential read/write 150 & 48 MB/s. Also note the 4k speeds. That's the spirit! I got bored, so did give it a try. Actually not so much, as @GreyFox7 quotes and my experience shows. I was tearing down an old desktop system with a lightly used Intel 730 SSD so I put it in a USB enclosure and attached it to my Surface 3. After changing UEFI to boot from USB device it booted right up, but was wonky: it would freeze randomly requiring hard (power button) shutdown, and Windows Activation started shutting down parts of the OS. Not surprising really since the Win10 on the SSD was configured for totally different hardware, including the Windows activation data. Some nice overall gains, and the system did boot up faster and was more responsive. BUT, as mentioned, the Windows setup itself needed to go, so I wiped the SSD and cloned from the eMMC to the SSD so that a workable version of Windows would be on the SSD. Right? Wrong. The external SSD would NOT boot into Windows. It would try and then go into Automatic Repair but could not fix itself. HOWEVER, it *would* boot into Safe Mode. Go figure. The only items in Device Manager with notations were the Display (Safe Mode used a Generic one), and Surface Touch keyboard items. I did try booting without the Touch keyboard attached, but it still wouldn't boot except in Safe Mode. 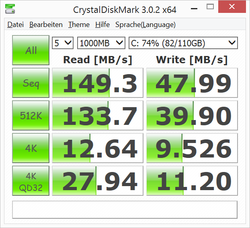 Here's Crystal Disk 5.0 on my Surface 3 with a Samsung 850 Evo SSD vs eMMC. You have a Samsung SSD connected to your Surface 3 via USB and it boots? How did you clone it to get a working copy? Nope this is just a benchmark on both disks booted off of the internal eMMC. As far as the original 730 issues ... there were probably many, I'd think at the least you'd need to Sysprep it, and toggle off the USB Drive "removable" status, probably also missing all sorts of drivers. I'm surprised it ever booted at all. Thanks. I'm tabling the project for a bit now. Later on I'll tackle it with fresh eyes. I'm surprised it ever booted at all. I thought I'd take the time to wipe the SSD clean now in preparation for further experiments later. Guess what? The same SSD, in the same SATA-to-USB adapter, with the same USB cable now is causing power surges in the Surface 3 USB port. Yes, the Intel 730 is a higher-than-normal power draw (1.3w at idle) due to lack of power savings features, but why/how in the heck did it work perfectly fine for the ten or so times I used it before?